Wings of Magloryx is an indie title on the Wii U released via the Eshop, and sees players take control of a dragon called Magloryx. This fire-breathing behemoth is on a quest to reclaim his five relics that were stolen by a wizard, all while collecting some treasure and kidnapping a few peasants along the way. It’s certainly a promising concept. After slaying countless dragons in fantasy video games, it’s about time the roles were reversed, and the idea of playing as a dragon and destroying everything in your path sounds like fun. Unfortunately, the game’s execution lacks a whole lot of polish, and the end results leave a lot to be desired. Gameplay-wise, Wings of Magloryx is simple enough: You travel across five different worlds (a total of twenty-five levels), with each level being a small series of floating islands. 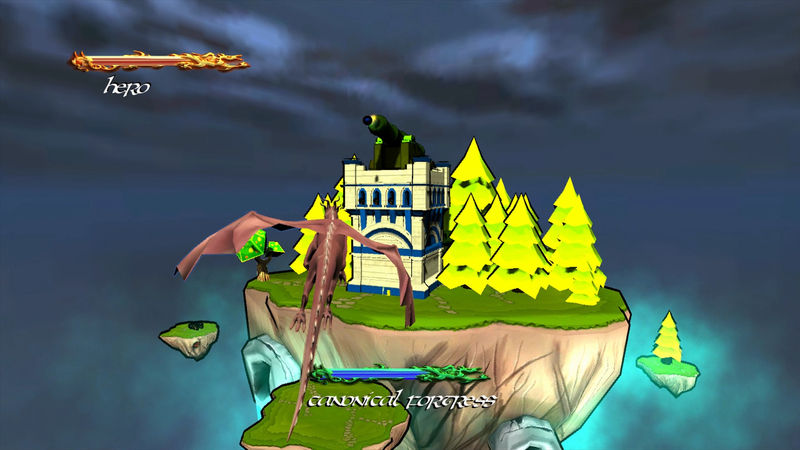 The goal of the levels is to either destroy a set amount of towers, or to defeat a boss. Bonus points are received for “rescuing” peasants (we all know Magloryx is really collecting his dinner). The controls may seem simple at first, with Magloryx’s actions simply consisting of moving and shooting fireballs. But again, things stumble in execution, and the controls end up feeling clunky. The left joystick moves Magloryx around, which is simple enough, while moving the right stick up and down changes the height in which the dragon takes to the air, and moving it from side to side changes the camera. Additionally, the ZR button is used to shoot fireballs, and pressing down on the right joystick is used to collect treasure and peasants. Here’s where things get tricky: The camera movement alone is muddled, and using the same joystick to maneuver the camera and Magloryx’s height never feels right. The dragon himself also moves slowly and awkwardly, and shooting fireballs is incredibly inaccurate. Picking up peasants and treasure is the most cumbersome, however. You have to be low enough to the ground for this action to work (a problem in itself, as even the slightest bump to a rock or tree does damage), but even worse is that, half the time, pressing the right joystick doesn’t even seem to work. You have to keep pressing the right joystick until sparkles fly out of the peasants or treasure, and then fly into them to collect them. It just never feels right, and you just wish you could simply fly into the collectibles without the need of any extra button presses. Another problem occurs when you inevitably bump into the countless “invisible walls” in the game. You would think the boundaries of the stages would coincide with the layout of the environment, but that’s not the case. Often times you’ll be circling around an island trying to eliminate enemies, and then are suddenly stopped dead in your tracks as the words “out of bounds” appear in the middle of the screen. It happens far too often, and it’s hard to figure out the levels when the stage design and technical limitations don’t mesh together. Something else that really bogs the game down are the constant slow-downs. If even just a couple of enemies are onscreen throwing swords or shooting arrows at you, you can count on the game slowing down to a near halt. Things are made all the worse through multiple graphical errors. Though the game has decently colorful and fun graphics, you’ll often notice that the destruction animations for the towers rarely work like they’re supposed to. You’ll destroy the entire tower and yet its windows will still be floating in midair. Enemy health bars will also remain onscreen long after the enemies themselves are defeated. And sometimes, you won’t even notice the enemy health dropping at all. You’ll just be bombarding them with fireballs, the enemy will be frozen still, with the fireballs seemingly passing through them, then the enemies will suddenly die. It’s details like this that make the game feel unfinished. On the bright side of things, the music is pretty enjoyable (if nothing particularly memorable), and the fact that certain levels branch out the world map means you can tackle most stages at your own pace. You can even buy spells with the collected gold to change things up ever-so slightly. It’s a shame then, that such a fun concept as taking control of a dragon to lay waste to the land ends up feeling so rushed and unpolished. This is an idea that could have produced a fun (if admittedly simple) game. Instead, playing Wings of Magloryx can feel like a chore, and some of the game’s aspects are so unfinished you can’t help but feel that Wings of Magloryx is little more than bargain bin fodder. Sounds like Wings of Magloryx is the new Lair. If the right stick is used to adjust the camera, that should be its only function. I’ll bet there were several times when you tried to look up or down only to accidentally change height. It’s never good when the designers fail to take into account the control schemes of their peers; that was something which made Spec Ops: The Line so frustrating to get through.